In my last Extension Update column I indicated that I was not going to share any more York Extension Centennial Notes, but I’ve changed my mind and will share one more and ask for your help. I been preparing a power point about the history of irrigation in York County and Nebraska. So, if you have pictures or tidbits of information that you’d be willing to share, bring them into my office and I’ll scan the images or email me that info to me. I’d like to add images and bits of information to the presentation. THANKS IN ADVANCE! 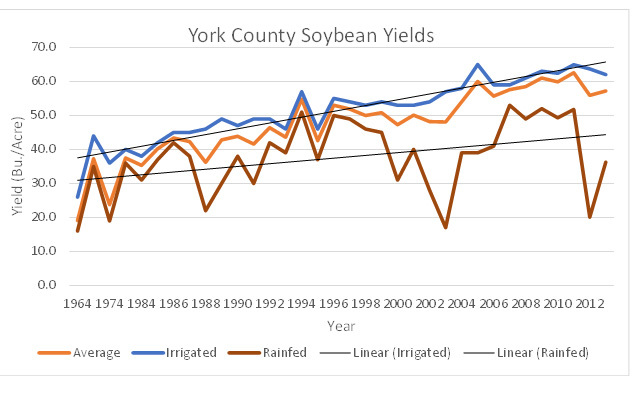 Over the years, I’ve tried to continually update information about the York area rainfall. For 2014, we received 35.19” of precipitation, this compares to our 94 year average of 26.99”. The 2014 total ranks 9th out of the 94 years of data I have, the top year I have was 40.37” in 1993. My figures are not exact, but they’re close. In August we received the 4th most precipitation for a month at 10.22”. The top historic months I could find were 16.04” in 1950; 13.60” in 1967; 10.46” in 1958. One thing for sure no two years are the same and you cannot predict the weather! 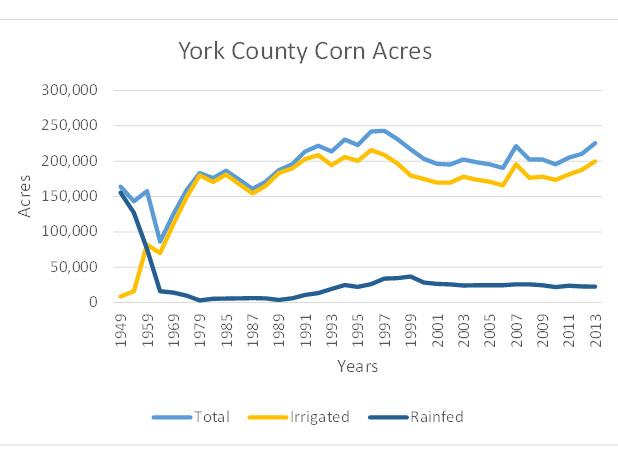 I also have file that I continually update with the York County corn and soybean yields and acres planted over the years. The data is from the National Agricultural Statistics Service (NASS). I’ve charted this information and will include this with this week’s column. The data is from 1949 for the corn and from 1964 for soybeans. In 1949 we raised about 150,000 acres of corn most of which were rainfed. Today, we have around 225,000 acres of corn most of which is now irrigated. 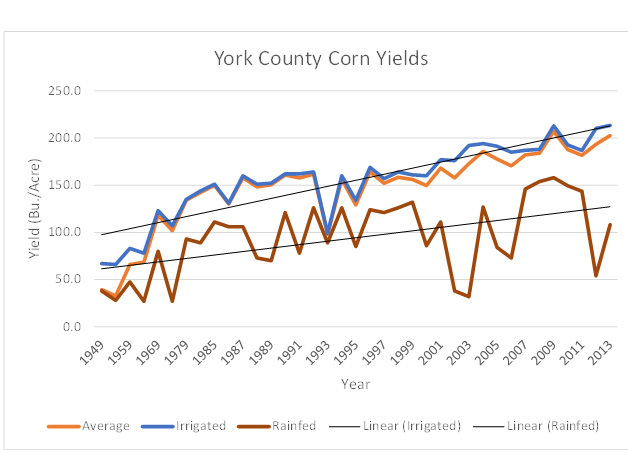 Since 1949 our irrigated corn yield have gone up about 3.2 bushels/year. For irrigated corn, we’ve gone from less than 100 bushels/acre to now over 200 bushels/acre. 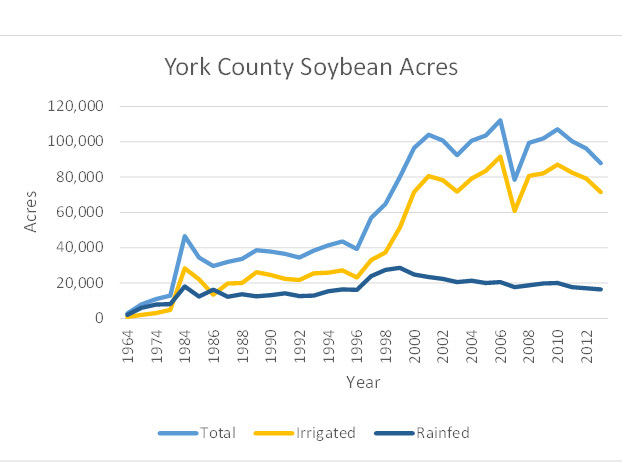 Since 1964, for soybeans we’ve gone from planting very few to planting about 90,000 acres most of which are irrigated. Over the years, irrigated soybean yields have gone up by about .85 bushels/acre/year and now average 60-65 bushels/acre. We’ve sure made great progress in producing more crop and at the same time become more efficient with both nutrient and water utilization. We need to continue to make improvements if we’re going to be able to feed our world’s population. It will be interesting to see what crops we are growing 50 years from now as well as what the yields will be? This entry was posted in Extension, Irrigation Manaagement and tagged Corn, Extension, Soybeans. Bookmark the permalink.